On a Sunday morning in early January, it snowed for the first and only time last winter. Reba, a 7-year-old Quarter Horse mare, was excited by the new blanket of snow cover and was running on a hillside along the fence line. She slipped and had a serious collision with a T-post, resulting in a 45 degree bend in the post just above the metal flange. Corrina, Reba’s owner, had purchased her just a few months earlier with intentions of using her for reining and gaming. She was horrified when she arrived at the scene and saw a devastating wound on Reba’s right hind leg. She rushed the mare to the clinic, all the time worried that Reba would have to be put down. 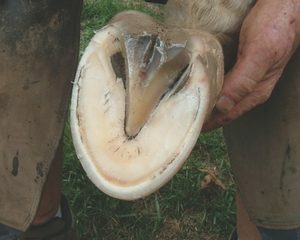 The good news was some particularly vital structures, including the flexor tendons, tendon sheath, suspensory ligament and fetlock joints had been somehow spared. In addition, though very exposed the cannon bone was not fractured. However, the size, contamination and bone exposure of the wound posed potentially grave complications of bone infection, soft tissue infection, proud flesh, prolonged healing, awful scar formation, a permanently enlarged lower leg and other worries. One thing was certain: this was going to be a long process. After encouragement from our small animal veterinarians who use laser therapy much more often, and confirmation from the laser manufacturer technical support on its safety over exposed bone, we decided to aggressively use laser therapy on Reba. Early response was so impressive we continued and over 3 ½ months Reba received 31 laser therapy sessions. Relieves pain by stimulating the release of beta-endorphins, stabilizing nerve cells, relaxing muscle, and increasing the threshold for pain perception. Reduces inflammation promoting better circulation of blood and lymphatic flow and by inhibiting the production of inflammatory mediators. Speeds tissue repair and cell growth by increasing the energy level of the cell, increasing the rate of cell division, stimulating regenerative cells, stimulating nerve regeneration and scar tissue remodeling. Improves circulation within damaged tissue by stimulating the formation of new capillaries and by causing dilation of blood vessels. The speed of granulation tissue growth (the connective tissue that first fills in the space of an open wound). The dramatic reduction in proud flesh that we normally see in such wounds. The impressive reduction in scar size and overall leg enlargement we see in such wounds. Because Reba came to the clinic so often for her laser treatments, we were able to make frequent adjustments in her treatment – what dressings to use, how often to change the bandage, when to surgically cut off proud flesh.